The reception area mediates the change in level between the entrance and the ground floor exhibition space in the second building, where a 17-foot high ceiling accommodates large sculptures and paintings by contemporary artists. The walls of this gallery are rotated slightly from the orthogonal column grid, maximizing interrupted wall surfaces, and creating a new pure volume within a space whose perimeter had been compromised by columns, ducts and pipes. A wide stair leads to a mezzanine, lit by six new windows, overlooking the main floor. The stair continues from the mezzanine to another gallery on the second floor of the third building. 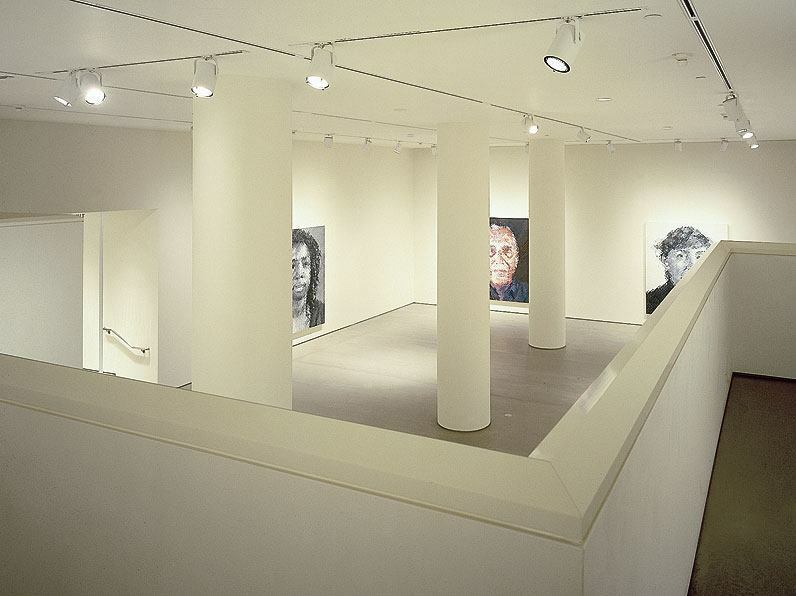 Here, the grid of the existing columns and beams is used to modulate the long interior volume along Rodeo Drive, creating a series of intimate galleries, suitable for exhibiting similar works, drawings and photographs. Along the perimeter of the building, a “floating” wall, articulated by a single row of glass block at either end, stops at the underside of the beams, and is lit from behind. In addition to controlling natural light from five existing windows, the wall creates both the primary hanging surface and a “street façade” for the gallery. Behind and beyond the exhibition area are private offices and viewing rooms, accessible from both the gallery space and a separate elevator lobby.